This whole giving-up-sweets-for-lent thing is not working so well for me this year. This weekend, I’m in Florida with my mom to celebrate my grandmother’s 83rd birthday. About a minute into our car ride from the airport, my mom asked me to make a chocolate birthday cake. I mean, I can’t make my grandma a birthday cake and then not eat any of it with her, right? In between the chocolate covered strawberries and chocolate birthday cake, I made these muffins. Muffins would normally go in the breakfast category, as opposed to the dessert category, wouldn’t you say? You could argue that these muffins have chocolate in the mix, which classifies them as dessert. I would counter that they are relatively low in sugar and have very little fat. And they have strawberries. Totally breakfast. In a large bowl, whisk together flour, cocoa, baking powder and salt. Then whisk in sugar. In a separate small bowl, mix eggs, yogurt, vanilla, oil and applesauce. Add wet ingredients to the dry ingredients. Mix until just combined. Fold in strawberries. Pour batter into muffin pan and bake for 18-20 minutes, or until toothpick inserted comes out clean. As I said, these muffins are not overly sweet. If you’d like yours sweeter, increase the sugar to 1 cup. Or, do as Adam and I did--zap them in the microwave for 20 seconds and eat them with a slather of brummel & brown and a drizzle of honey. So dang good. Also, if you use muffin liners, and, like me, have little self-control around baked goods, be warned that the muffins stick to the liners when they’re hot out of the oven. Wait about an hour and they should come out just fine. Muffins were adapted from this recipe. Since the title of this blog is “Stew or a Story,” I knew I eventually needed to whip up a stew recipe, and seeing as stew-eating weather may be on its way out soon, now seems to be the ideal time. I’m also obsessed with butternut squash and am intent on cooking and eating it as much as possible before it goes out of season. Enter this stew: Moroccan chickpea. I usually decide to make a certain recipe after a moment of inspiration. I read a recipe in a magazine or on a food blog. I browse through a cookbook or a co-worker mentions something she cooked last week. This past week I had the idea of making a stew, but I hadn’t started looking for recipes. Then, Thursday morning, totally out of the blue, an idea popped into my head: Moroccan Chickpea Stew. I hadn’t seen the recipe anywhere. I’d never eaten anything like it before. I wasn’t even sure it was a real dish. A quick google search confirmed that it was, in fact, a thing. I found a couple different promising recipes here, here, and here, and took bits and pieces from each one to meet my vision: flavorful, veggie-loaded, and crock-pot accessible. Though I’ve never cooked Moroccan food before, I have eaten it a couple times. It’s usually made in a tagine, a dome shaped ceramic dish that bakes for hours and allows all the steam and liquids released during cooking to drip back down into the food. When I think of Moroccan food, I think of a big pot of flavorful hearty stew, served family style, with people reaching across the table to grab a spoonful or swipe a piece of bread through the mixture. This is my kind of thing. Unfortunately, I do not own a tagine, but I do own the next best thing. A crock-pot. I love my crock-pot. I feel a little embarrassed admitting that, because I know they are not exactly bastions of gourmet cooking. However, they make food that is delicious and easy, and sometimes on a busy week night, they make a homemade dinner possible. My crock-pot did not fail me with this stew. Long and slow cooking is the key to this recipe. The medley of spices and flavors is unique but not overpowering, and eating a bowl of it fills you with comfort and warmth. Adam is away for the weekend, so I've been home alone. Yesterday it was snowing/hailing/raining on and off all day, so this stew was the perfect thing to cuddle up with on the couch. Today I went to a yoga class, and half-way through the instructor played the audio for this story about the love of an older couple. I bawled my eyes out. Luckily, it was a hot yoga class, so I was already drenched in sweat and I don't think anyone noticed the tears streaming down my cheeks. When looking for the link to share with you guys, I heard the video again, and again, I cried. I'm crying a little bit thinking about it right now. Friends, watch the video, maybe make this stew, and tell someone you love what they mean to you. Optional--Heat olive oil in a large pot over medium-high heat. Add onion and carrots and saute until the onions begin to turn translucent and carrots are slightly softened and browning. Add in garlic cook 1 minute more. If you want to skip this step, just throw everything in the crockpot. Precooking the onions will just draw out a little more of their flavor! Add vegetable mixture into the crock-pot, along with the butternut squash, spices, canned tomatoes, chickpeas, vegetable broth, sugar, salt and pepper. Before serving, remove 2 cups of chickpea mixture and mash with fork or potato masher. Return to pot. Season with salt and pepper to taste. This would be delicious served over rice or couscous, or, as I ate it, with plenty of crusty bread for dipping. Also, this recipe makes a LOT. (for not a lot of money!) I will probably end up freezing some of it to enjoy later. *On a side note, I know this is a long list of spices. If you don’t have them all and don’t want to buy them, I would say the essential ones are the cinnamon, cumin, and curry. Sunday afternoons can be a bit of drain around here. I’m usually anxious about a busy week ahead at school and all the grading and planning I’ve procrastinated on all weekend. Of course there’s also the piles of clothes that need to be washed/dried/folded/ironed, a sink full of dishes that need to be washed, a dishwasher full of clean dishes that need to be unloaded, and any other assortment of personal items (bills, emails, doctor’s appointments, etc) that need to be attended to. 1.) Go into super-productive mode and work through everything on my list. 2.) Go into paralyzed mode and sit stressing over everything I have to do. Today I did neither. I was on the verge of #2 when Adam asked me if I wanted to go for a drive. I said yes. Thinking that we would never get out of the car, I wore my red Toms with a big hole in the toe, black stretchy pants, an old fleece that doesn’t zip up, and zero make-up. We drove to the airport overlook and watched planes take off and land. Well, Adam did. I watched the 85-year old man in the pick up truck who listened to his CV radio while looking through his binoculars at each plane. And the 8 year-old boy who put his arm around his 2 year-old sister. And the balding 40-year old man who took photos of each plane while sitting on a bench next to his wife. No agendas, no plan, just plane watching and people watching. Then we drove to a big park neither of us had ever been to before. We walked through some trees and around a lake and over a bridge. I tried to take a picture of Adam by the lake under the big bright sun, but he was squinting. And frowning. And instead of stressing about all the things to do today and tomorrow and next week, and the uncertainty that is ahead, I just let go. I said a prayer of thanks for this beautiful life I have been given and the person I get to spend it with. This was just a moment of course. We disagreed about whether to keep walking or go back. On the drive home he was stressed about the thought of moving, and I had a headache from looking at my phone in the car. Life is not perfect. That laundry will not get done in time for tomorrow, and the dishes will sit there another day or two, but I don’t care. It was the best afternoon I’ve had in a long time. Now I have to tell you about this rice, because it is amazing. It’s choc full of nutrients from the kale and butternut squash, as well as the black rice, which is rich in antioxidants. The inspiration for the butternut squash/kale/bacon/Gruyere combination came from a pasta recipe on the wonderful Eats Well With Others blog. I have since found proof that others are convinced of the power duo between this sweet winter squash and hearty dark green, with recipes such as butternut squash and kale quesadillas, butternut squash and kale quinoa, or even simple butternut squash and kale salad. Anyway, I loved the original recipe when I made it, but I was curious about what the other possibilities with the power duo might be. Joanne, who is a healthy vegetarian, made her sauce with greek yogurt and vegetable broth and used tempeh bacon. I used real bacon and doubled the amount in the original recipe because, well, if Adam had one refrain in his experience with eating my meals it would be, "More bacon!" In place of her sauce, I made I made a Gruyere béchamel sauce. If you have never made béchamel sauce, you are missing out. It’s a creamy sauce without cream. The essential proportion is 1 tablespoon butter, 1 tablespoon flour, and 1 cup liquid. (I use broth or milk, depending on the recipe) You melt the butter and then add the flour, stirring until a yellow bubbling paste forms. Then, stirring constantly, you add the milk in small batches. Then you add the cheese and things get really serious. My last change was to use black rice instead of pasta. This was my first time eating black rice, and I was delightfully surprised with the results. It’s a little softer and chewier than regular brown rice, almost more like a risotto in texture. The extra nutrients are an added bonus. Oh, and it turns purple when it cooks. How many purple foods have you eaten recently? The final result is one of my favorite dishes to date. The rice is rich and creamy, punctuated by sweet bites of butternut squash, savory bacon, and, just to make things interesting, the crinkled texture of the kale. It’s filling and comforting and definitely still good for you. My best friend Steph was here to visit this weekend, and she ate some as a snack yesterday afternoon and then again this morning for breakfast. I can’t stop eating it, as evidenced by the fact that I keep snagging spoonfuls from the fridge when Adam’s not looking. My lackluster photography skills and the un-photogenic nature of this dish do not a great combination make, but I PROMISE you will not regret making this recipe. Bring 2 cups chicken broth and black rice to a boil. Reduce heat to low, cover, and let simmer for 35 minutes. Toss butternut squash with olive oil, salt, and pepper on a baking sheet and roast for 10 minutes. Remove from the oven and use a spatula to toss pieces over. Roast for an additional 10 minutes. Melt 2 tablespoons butter in large saucepan on medium high heat. Add onion and cook for 5-7 minutes, stirring frequently until onion is golden. Add 2 tablespoons flour and stir until yellow bubbling paste forms. 6Add about a fourth of the milk, stirring continually until the sauce thickens. Continue adding small amounts of milk and stirring until you have a creamy sauce. Add a sprinkle of salt and pepper. Add cheese, stirring until melted, then add kale and cook for 2 minutes until kale has slightly reduced in size. Add crumbled bacon, rice, and squash. Stir until all ingredients are heated through. Although I am in love with this dish, I will admit it is pretty time consuming, mostly because of all the prep work for the vegetables. To make this an easy week night dinner, roast the squash and chop the onion and kale the day before. So I stumbled across this essay via this blog earlier in the week, and I've been thinking about it ever since. Joy and pleasure have always seemed to me distinct yet interrelated, though I find myself drawn to Smith’s description of joy as a “strange admixture of terror, pain, and delight.” Unbridled joy is a vulnerable experience. It is free from structure or expectation or pretense, and I think in that lies the terror. Pleasure, on the other hand, is comparatively simple. One of the most accessible pleasures for most of us I think, is preparing and eating a meal. I’ve heard friends of mine say things like “I’d cook more if I had someone to cook for,” but I must disagree. While I always enjoy preparing a meal for friends or family, I find exquisite pleasure in the act of cooking for myself. I can make exactly what I desire at the moment, and eat it whenever and wherever I like. I guess it’s a small way of telling myself that I’m worth it. I’m worth a homemade meal, and friends, you are too. Most often for me, this meal is some kind of pasta with vegetables sprinkled with lots of cheese, which is essentially what this dish is. It’s the kind of thing I’ve been assembling for years without a recipe, and I never wrote the ingredients down until asked to by a friend. There’s no butter or cream in this pasta, but the sauce is lovingly thickened by the additions of wine and starchy pasta water. Fresh cherry tomatoes would be wonderful here if they were in season, but I find that the can of diced tomatoes works fine too. The key for my personal preference is to cook the onions until they are caramelized and sweet and the mushrooms until they are small and browned and have lost all semblance of their former rubbery mushroomness, but the choice (and pleasure) is all yours. On a side note, last week I mentioned the word pleasure to my students, (as in the word amateur means a person who plays a sport for pleasure, not for money) and afterwards I was the brunt of many snickers and inappropriate comments. Someone please save me from all the thirteen year old boys in my life. 2.) Add diced onions to skillet and cook for 5-7 minutes or until onion is starting to become translucent. Add in the sliced mushrooms and minced garlic and cook another 5-7 minutes until mushrooms are soft and onions are fully translucent. 4.) When the mushrooms and onions have reached your desired texture, turn the heat to medium high and add the wine. In cooking terms, you are deglazing the pan, which means that the wine picks up any delicious bits of olive oil or onion that have stuck to the pan. 5.) Cook for 2 minutes, or until half the wine has evaporated, then add the can of tomatoes and cook for another 3 minutes. 6.) Add in the ¼ cup reserved pasta liquid and ¼ cup grated parmesean cheese and cook until slightly reduced. 7.) Add pasta and cook 1-2 minutes. 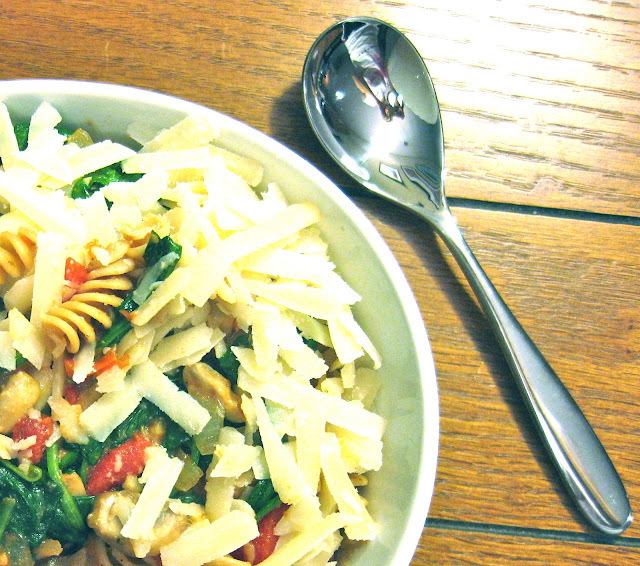 Toss in spinach and sprinkle everything generously with shredded parmesean cheese. Serve yourself a generous portion in a large bowl with a large spoon. Enjoy.